Here are some gifts I made earlier, in true Blue Peter style. And while it’s not quite the same sewing hit as making a garment to wear, it’s a good feeling to give friends gifts you’ve made yourself. 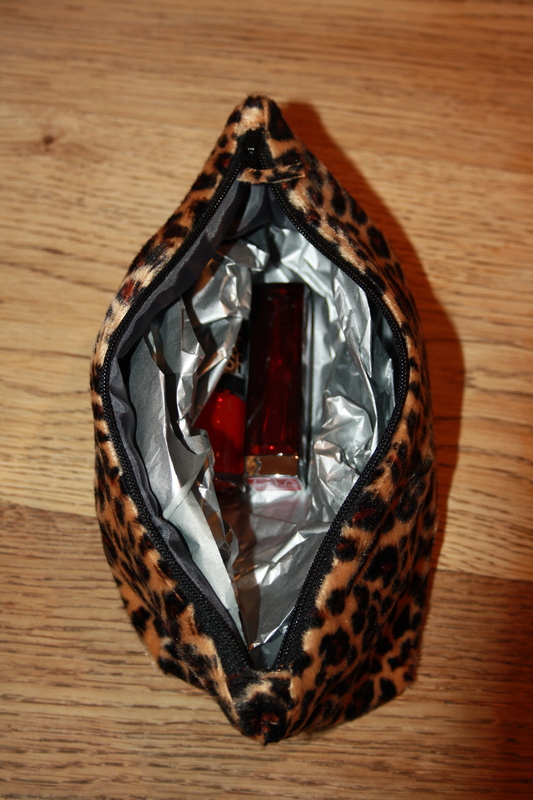 (As long as they like them of course…) So, I give you – or even them – the leopard skin make-up bag and the big cat collar. As I seem to spend most of my time either reading sewing blogs, musing on sewing projects or actually sewing, I find the short synopses that many sewists share very helpful. 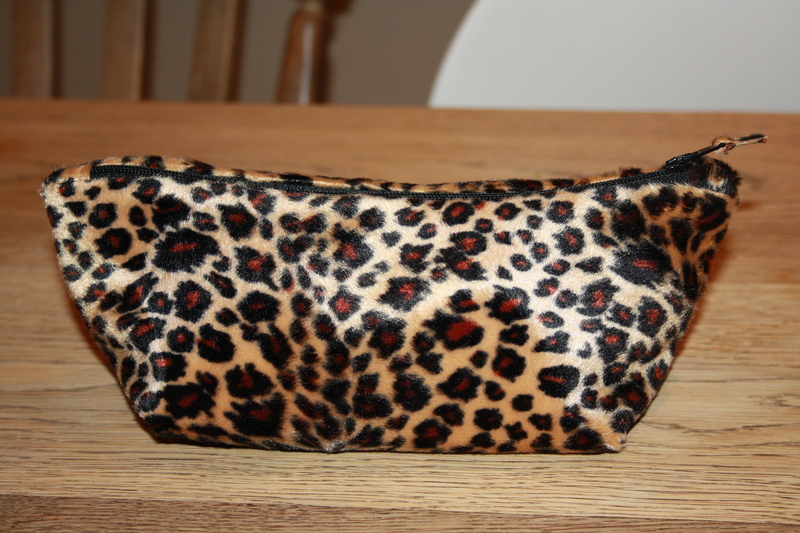 I thought this fabric might spew fur like a spewy thing when cut, but because it was short pile it didn’t, so much so I could attach a small zip pull to the make-up bag quite easily. The only challenge for this Panda was the lining fabric that slinked around and I even managed to cover the zip ends as per the instructions. The furry detachable big cat collar was easy peasy to construct as you’d expect from the wonderful Tilly and I whipped up two in one evening. I made one with the same lining fabric I’d used for the make-up bag and the second I used an off-cut of organic pin-stripe cotton. The latter will be the gift as, quite frankly, it’s better! This is the third Tilly pattern I’ve used and she’s just fab, always making me feel like a remotely proficient seamstress. Her instructions are always clear and detailed, perfect for the beginner or rusty sewer like me. 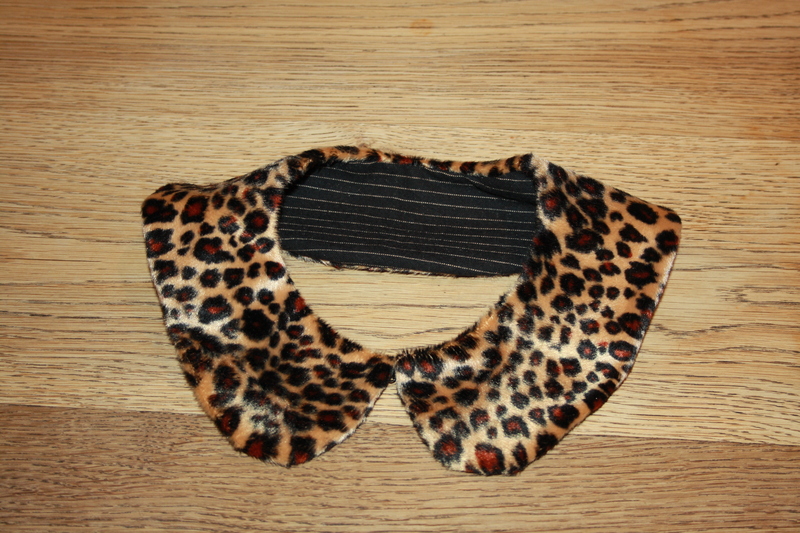 I was quietly amused (as I am a lot of the time) to realise that the collar will be for my dear friend Polly Pocket, from a pattern by Tilly Button. Anyway, I’ll be back, in true Arnie style very soon, having completed another garment this week. My anxious/furious sewing was fuelled while listening to a rather important footie match on the radio. All’s well that ends well this time for Sunderland FC. A new top and a cup final to look forward to: Wednesdays don’t get much better than that. And sewing aside for one moment, who else could I turn to (lyrically) after a victory over Manchester Utd in a cup semi-final? It’s been a while since I last wrote, but here’s a bright shiny New Year and the twigs have finally got their pjs. Every time I’ve finished a project I think “damn it” I was supposed to photo as I go and show my shoddy workmanship as it happens. I still haven’t quite gotten over the fact that I think I don’t really believe I have the right to offer anyone the benefit of my limited knowledge. Nevertheless, I have started liking some of the blog posts of my fave sewing bloggers, and believe me, that feels quite out there for me, for the moment. 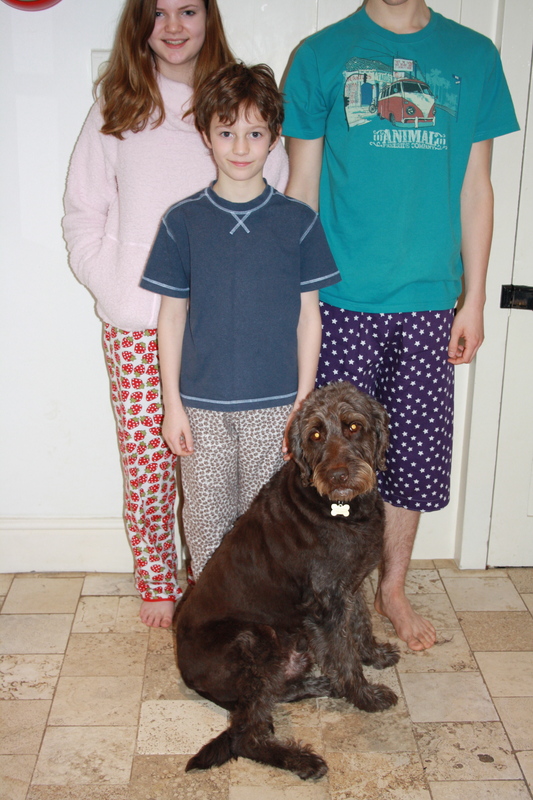 Back to the jim-jams. First up was Cotton-Eyed Schmo in his elephants-go-walkabout pair. 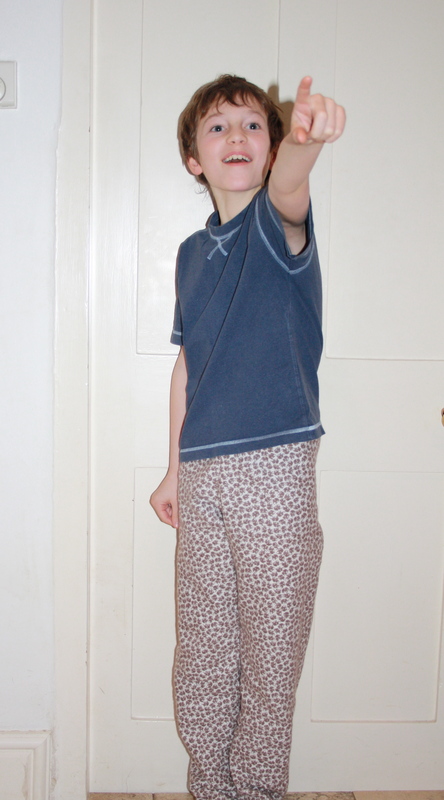 I was too tight to buy two patterns for pyjamas so as I’d already purchased the Simplicity 9781 to cover the children now taller than myself, I thought I’d have a go at “drafting” a junior pair for my skinny nine year old. Surprisingly it worked without constricting my boy in his vital areas. 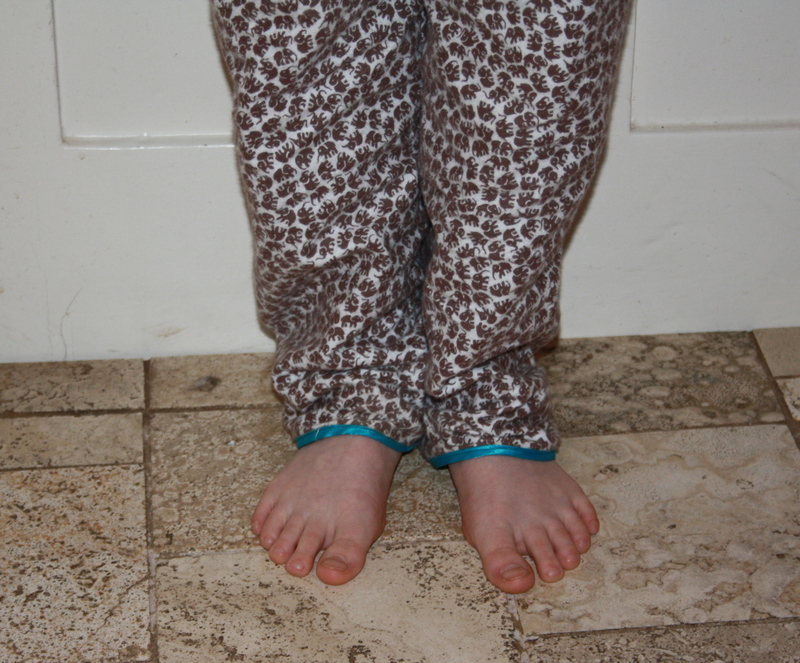 I started off at Handmade Jane‘s blog and read all about her pj construction for her boys and followed the links. If only I could remember them for next time. I managed to make his pair out of one metre of a lovely elephant cotton flannel purchased from Plush Addict and had my first go at adding some satin bias binding. Sense of accomplishment B+. 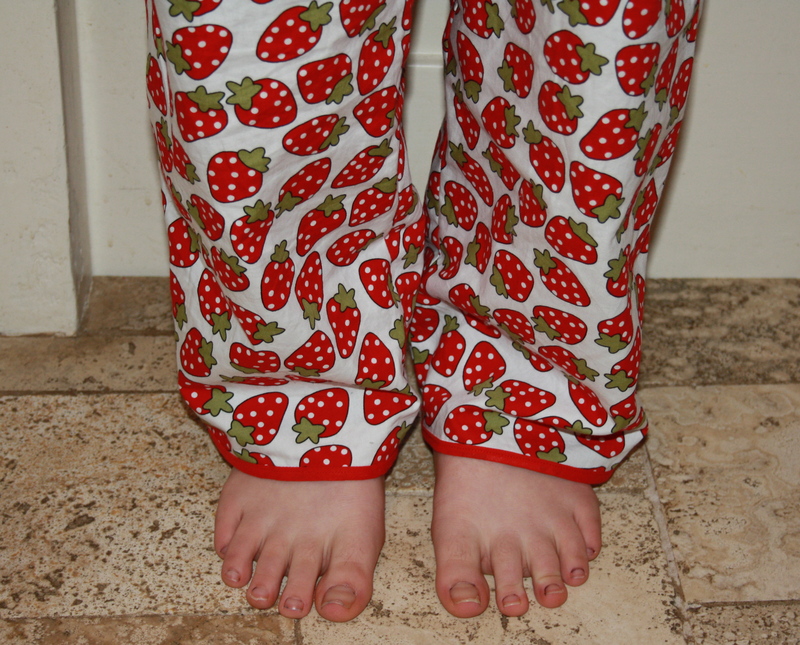 Next up was the strawberry set for my daughter. Again this fabric came from Plush Addict, and I was really pleased with the quality. So far so good. 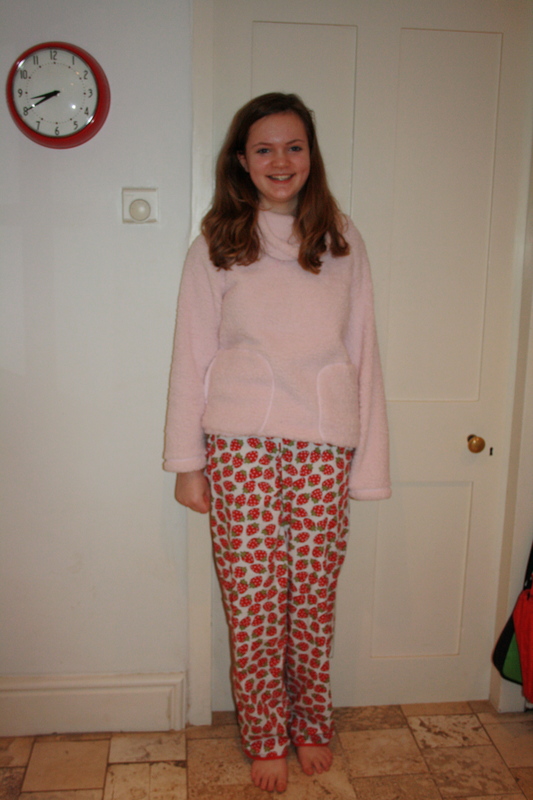 Measured daughter and cut out according to the pattern guide. Actually I made an effort to trace the pattern with my carbon paper gifted through our Secret Santa at work, sadly no tracing wheel until the big fella visted for real on Christmas Eve, so traced the pattern with a pencil. It worked. Sort of. Cut out pieces and they looked rather large to say the least. Got stitching, added more bias binding and voila: a pair of clown trousers with enough room for a small family of guinea pigs and their mobile home. After quite a bit of growling to myself I unpicked the waistband and cut FOUR inches off the outer leg seams, re-stitched and was delighted to see that they do now look like they should, rather than typical circus attire. Lastly, the camera shy 16 year old. The stars on blue (rather than 45) was ordered from myfabrics.co.uk before I realised that it was based in Germany not the UK. Dumbelina. I’d invested so much time looking for fabric that he would like, I couldn’t face starting from scratch again despite the hefty postage charge. All was going well until I trimmed the length as he wanted them skater boy style and I cut the second leg shorter than the one I’d already hemmed. I ask you. Anyone would think I wasn’t quite compos mentis after a severe lack of sleep on New Year’s Eve. I sustained an injury competing in Just Dance – a fairly innocuous move to Superstition by Stevie Wonder rendered my left arm immobile. Yes, I know, but pulling a muscle in your arm is super painful and cramps your dance and sewing style. Good job the other arm was still in working order, meaning that I could still reach my prosecco and bark orders from the sofa. Happy days! ‘What were the words I meant to say before you left?